Production: Champs-Elysées/Lux; black and white; running time: 90 minutes, some sources say 88 minutes; length: 7,885 feet. Released 1959. Producer: Jules Borkon; screenplay: Georges Franju, Jean Redon, Claude Sautet, Boileau and Narcejac, from the novel by Redon; photography: Eugen Schüfftan; editor: Gilbert Natot; sound: Antoine Archimbaud; art director: Auguste Capelier; special effects: Assola, Georges Klein; music: Maurice Jarre. Cast: Pierre Brasseur ( Professor Génessier ); Alida Valli ( Louise ); Edith Scob ( Christiane ); François Guérin ( Jacques ); Juliette Mayniel ( Edna Gruber ); Béatrice Altariba ( Paulette ); Alexandre Rignault ( Inspector Parot ); René Genin ( Bereaved father ). Franju, Georges, and others, Les Yeux sans visages , in Avant-Scène du Cinéma (Paris), June 1977. Durgnat, Raymond, Franju , Berkeley, 1968. Vialle, Gabriel, Georges Franju , Paris, 1968. Benichou, P. J. B., Horreur et epouvante , Paris, 1977. Grant, Barry Keith, editor, Planks of Reason: Essays on the Horror Film , Metuchen, New Jersey, 1984. La Technique Cinématographique (Paris), no. 196, 1959. Lebovits, Jean-Marc, and Francis Tranchant, "Entretien avec Georges Franju," in Cinéma (Paris), March 1959. Vérité, J. M., in Cinéma (Paris), July 1959. Variety (New York), 26 August 1959. Truffaut, François, "Entretien avec Georges Franju," in Cahiers du Cinéma (Paris), November 1959. Dyer, Peter John, in Monthly Film Bulletin (London), March 1960. Delahaye, Michel, in Cahiers du Cinéma (Paris), April 1960. Vas, Robert, in Sight and Sound (London), Spring 1960. Oms, Marcel, in Positif (Paris), May 1960. Tailleur, Roger, "Pour un portrait," in Prèsence du Cinéma (Paris), June 1960. Callenbach, Ernest, in Film Quarterly (Berkeley), Summer 1962. Ajame, Pierre, "Georges Franju; ou, La Terreur comme un des beaux-arts," in Nouvelles Littéraires (Paris), 30 January 1964. MacLochlainn, A., "The Films of Luis Buñuel and Georges Franju," in Film Journal (New York), Summer 1971. Gow, Gordon, "Franju," in Films and Filming (London), August 1971. Wood, Robin, "Terrible Buildings: The World of Georges Franju," in Film Comment (New York), November-December 1973. Milne, Tom, "Georges Franju: The Haunted Void," in Sight and Sound (London), Spring 1975. Badder, D. J., "Georges Franju," in Film Dope (London), April 1979. Conrad, Randall, "Mystery and Melodrama: A Conversation with Georges Franju," in Film Quarterly (Berkeley), vol. 35, 10 March 1982. Revault d'Allonnes, Fabrice, in Cinéma (Paris), 24 September 1986. Chevrie, Marc, in Cahiers du Cinéma (Paris), November 1986. Klein, Andy, in Los Angeles Magazine , vol. 33, no. 9, September 1988. Svehla, G.J., "Revisiting The Horror Chamber of Dr. Faustus ,"' in Midnight Marquee (Baltimore), no. 38, Spring 1989. Peyras, P., "Si tes yeux t'offensent, arrache-less!" in Focales , no. 1, 1992. Peyras, P., "Que cache le cadre de Bazin?" in Focales , no. 2, 1993. Brownlie, T., " Eyes Without a Face ( Les yeux sans visage )," in Film (London), vol. 4, no. 3, 1995. Sinclair, Iain, "Homeopathic Horror," in Sight & Sound (London), vol. 5, no. 4, April 1995. Télérama (Paris), no. 2371, 21 June 1995. Brown, G., "The Looking Glass," in Village Voice (New York), vol. 40, 21 November 1995. "Franju Classic Gets New Facelift," in Video Watchdog (Cincinnati), no. 31, 1996. 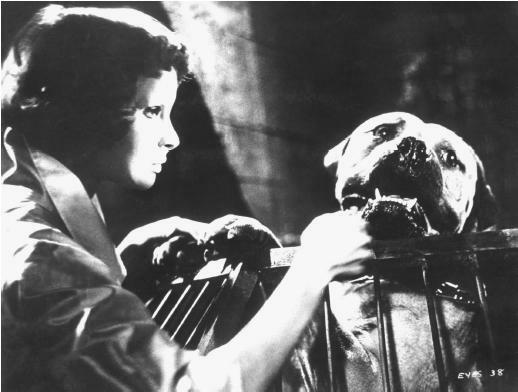 "When I shot Les Yeux sans visage ," Georges Franju recalled, "I was told: 'No sacrilege because of the Spanish market, no nudes because of the Italian market, no blood because of the French market and no martyrised animals because of the English market.' And I was supposed to be making a horror film!" Coming to the horror genre after co-founding the Cinémathèque Française, a varied career as a documentarist ( Le Sang des bêtes , Le Grand Méliès ), and the production of a single feature ( La Tête contre les murs ), Franju was bringing an unusually high-toned sensibility to a field at that time being revitalized by the new blood poured into old myths by Hammer Films in Britain and Roger Corman in the United States. However, for all his poetic approach, Les Yeux san visage is a triumphantly disreputable movie, closely allied to the Sadeian strain exemplified in Britain by Circus of Horrors (with which it shares a fascination with disfigurement and plastic surgery) and the misanthropic gimmickry of William Castle, whose The Tingler and The House on Haunted Hill are still undervalued for their lunatic originality. The storyline is deliberately rooted in the pulp tradition: a mad scientist, Dr. Génessier, kidnaps runaway girls for use in his diabolical experiments. Guilt-ridden because he is responsible for the disfigurement of his daughter Christiane, Génessier peels the faces of his victims and tries to graft their beautiful faces onto the girl's ruined features. And Franju is not above the usual flaws of the genre: he is very obviously not interested in the scenes of police investigation required to keep the plot moving, and he hurries through the mundane side of the story to get back to the bizarre ménage of the Génessier household, where Christiane prowls the dark corridors in a long raincoat and an eerily blank mask, her active eyes the only sign of life. Pierre Brasseur's smug scientist is a memorable monster, more plumply self-satisfied than Bela Lugosi or Boris Karloff, mistreating the vicious dogs who finally tear him to pieces, or presiding imperiously over surgical flayings which are depicted with all the dispassionate bloodiness of an unflinching documentary. But the most radical departure from the generic norm is the role assigned to Alida Valli—perhaps a development of the Simone Signoret character in Les Diaboliques , also written by the Boileau-Narcejac team—who plays the scientist's devoted assistant. No hunchbacked Igor figure, Louise is an ambiguously sexual predator who prowls the streets of Paris in a 2CV—the car's appearance given a sinister significance by Maurice Jarre's impertinent waltz—searching for the young girls her master needs for his doomed attempts at redemption. Les Yeux is a cruel but tender film, with Edith Scob's extraordinarily delicate performance as Christiane constantly reminding us that Génessier, however deranged, is sincerely acting out of love. The gothic trappings of the mystery-plotted first half, during which Génessier's house is lent an almost Cocteau-like life of its own by Eugen Schüfftan's outstanding photography, give way to a surgical cool as we follow the apparent success and ultimate disintegration of Christiane's latest facial graft. Here, the poignancy of the inevitable regression to monstrosity is as powerfully expressed as it is in such related science-fictional narratives as Frankenstein , The Island of Lost Souls , and Charly . Les Yeux was to remain Franju's best film, the one instance of harmony found between pulp poetry and art cinema. Although derivative of many earlier horrors, in particular Riccardo Freda's I vampiri , it even crystallized a certain sub-genre that became the province of maverick European horror filmmakers, as can be seen by the echoes in Jesus Franco's Gritos en la noche and Robert Hartford-Davis's Corruption . Franju takes a scalpel to genre cinema, piercing the conventionality of too many horror movies, and produces a personal, evocative nightmare fully worthy of comparison with its equally disturbing, equally Sadeian contemporary, Michael Powell's Peeping Tom .